Here are all the photos on Google+. Picked up a pain au chocolat for breakfast and walked down to Les Halles to E. Dehillerin Paris’s famous culinary store. We picked up some wooden spoons for me and a pastry rolling pin for Kristen. Walked around Les Halles a bit and saw two of the oldest restaurants in Paris. Pied Cochon and the Smoking Dog. Too early for lunch so we headed to St Germain des Pres. As we headed out of the metro the church bells were tolling. Walked around the oldest church in the city. 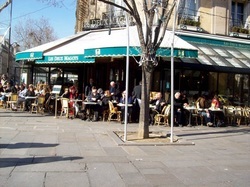 Across the street was the restaurant that Kristen really wanted to go to “Les Deux Magots”. K had Croque Provencal and I had the Salade Deux Magots. Both very good. Don’t know what they do to the chicken (tender and sweet). I’m thinking maybe a Bresse chicken? Walked around the Latin quarter and went down to Rue Jacob and passed Hotel Danube, The hotel Dave and I stayed in the first time we we’re in Paris 18 years ago! Then onto Luxembourg Gardens, the Pantheon and the Sorbonne. Went into a few shops on the way. Over to Rue St Michel which delivered us to the foot of Notre Dame. The dogs are barking now and Kristen is tired and grumpy. Walked to the Pompidou and went to Cafe Beaubourg for a drink and to rest the feet. Too early for dinner so back to the hotel to rest up for a ½ hour. Good thing we took a break, it took us an hour and ½ before we found a place for dinner. K was being too picky. Cafe Absthinthe looked nice, but when we walked into the enclosed outdoor seating area a mouse ran by. Eeeeek! Couldn’t bring myself to go in. Just pictured Ratatouille. So we ended up at Cafe Republique for our last night in Paris. Steak with pomme frites and creme brulee.